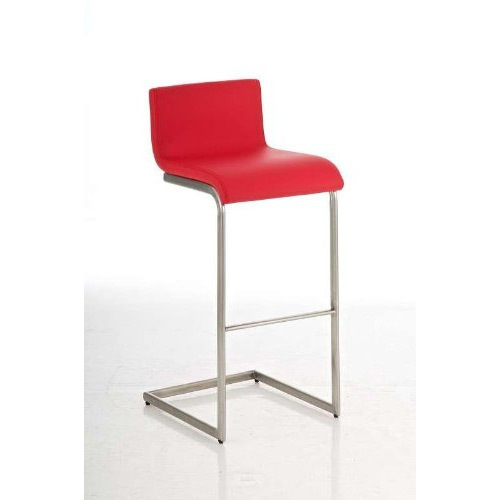 Available in 11 colour choices the Newport style red breakfast bar stool from CLP is a modern looking bar stool that will compliment any style of kitchen design no matter what the colour scheme. The Newport red bar stool is very stylish and is positioned at a fixed total height of 96 cm with a seat height of around 75 cm. The 4 cm padding on the Newport red breakfast bar stools seat is covered in faux leather and the additional 21 cm backrest provides lower back support, making it a nice choice if you wish to feel a little more supported. The stainless steel rectangular base of the bar stool also features an added footrest to allow the user greater comfort and control when getting in and out of the bar stool.